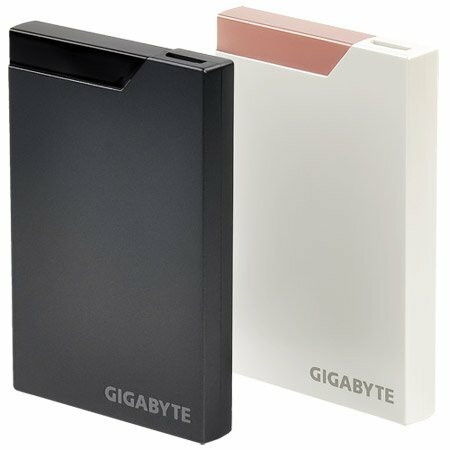 Gigabyte rolls out the A2, a new 2.5" external hard drive with USB 3.0 interface. The disks are available in capacities of 320GB, 500GB, 640GB and 750GB. Pricing and availability is unknown. GIGABYTE is thrilled to introduce its new 2.5-inch external hard drive, A2. With the eye-catching dual colored design with the ultra fast USB3.0 interface that comes in two eye-catching colors: charcoal grey and pearl white and available in four capacities, 320GB, 500GB, 640GB, and 750GB. A2 measures 113 x 76 x 14mm, weighs 136grams, and only 1.4cm in depth, so that you can easily slip in any pockets and carry all your important data and files with you wherever you go.The unique dual colored casing is varnished with a finish that helps to prevent transferring embarrassing fingerprints onto the chic surface; the latest USB 3.0 interface offers super fast transfer speed up to 4.8 gigabits per second, which is 10 times faster than the conventional USB 2.0 interface and is backward compatible. It is internal shock-proof, which means that if you accidentally drop your disk drive, the internal mechanism will absorb the vibration and leaving all your files unharmed and safe as ever!